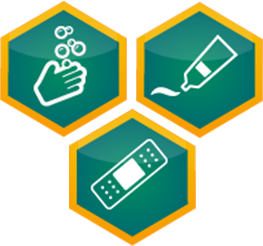 NEOSPORIN® First Aid Products offer the infection protection needed for all your minor cuts, scrapes, and burns, but have you thought about all the times and places when you could have treated with NEOSPORIN® Products? 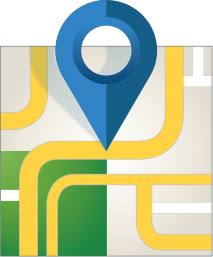 Where do you use NEOSPORIN®? It’s better to be safe than sorry. Did you know that approximately 43% of cuts and scrapes occur outside the home? If not cared for immediately, even minor wounds can become infected; but fortunately, we’ve got you covered. Below are a few places where keeping NEOSPORIN® Products handy could help keep you protected from infection. Minor wounds can happen to anyone while on the go, no matter where you or your loved ones might be. Luckily NEOSPORIN® + Pain Relief NEO TO GO!® First Aid Antiseptic/Pain Relieving Spray is a durable, non-aerosol spray that’s crush-resistant and small enough to fit in your glove compartment. Count on having the right infection protection for your family, even if you’re miles away from home. According to a recent report many bacterial infections that cause skin infections are commonly passed between athletes at the gym. Keep a tube of NEOSPORIN® + Pain Relief Ointment in your locker or gym bag—and apply it immediately to minor cuts and scrapes to kill germs and help prevent infection. 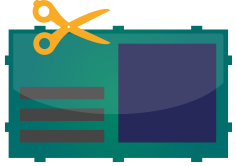 Every office has its hidden dangers, whether it’s sneaky scissor blades or dreaded pieces of paper. Treat those annoying papercuts with NEOSPORIN ® + Pain Relief Ointment. It relieves the pain associated with minor cuts and scrapes and protects against infection, so you can get back to your busy schedule. Let’s face it, kids will be kids, and at some point they’re going to get hurt when we least expect it. 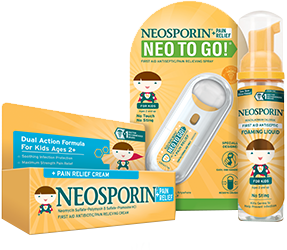 Whether it’s on the monkey bars, during the second half of the game, or while learning how to ride a bike, you can count on NEOSPORIN® + Pain Relief NEO TO GO!® First Aid Spray For Kids to keep their wounds protected from infections, anytime, anywhere. From cuticle tears, to curling iron mishaps, NEOSPORIN® + Pain Relief Cream soothes painful nicks, cuts, and scrapes and kills germs. Did you know that all NEOSPORIN® Tubes and NEO TO GO!® Sprays are TSA-approved sizes? When traveling, pack NEOSPORIN® and be prepared for any mishaps you encounter on your travel adventure. Properly care for your wounds with these NEOSPORIN® products.